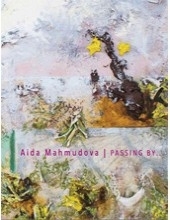 New York, NY – Aida Mahmudova’s first solo exhibition in the United States, Passing By…, will be on view at Leila Heller Gallery, 568 West 25th Street, from May 28 – July 3, 2015. The exhibition will feature seven new paintings that build on the themes of nostalgia and memory found in her past work and draw inspiration from the landscape and architecture of Azerbaijan where she currently lives and works. Mahmudova animates the surface of the canvas drawing attention to both the process of painting and the material qualities of the paint itself. Mahmudova plays with depth, perspective and scale, creating large-scale scenes that draw in the viewer. A structure of bold planes of color is combined with layers of textured brushstrokes. The painted surface is further animated and enlivened with the addition of materials such as polyurethane foam over which an impasto application of paint is applied to build volume. In this series of paintings, Mahmudova explores the idea of impermanence. The works provide glimpses of Azerbaijan’s natural surroundings, urban environment and architecture—a backdrop that is undergoing constant and rapid change. Where one expects to see contrasting images of gleaming new construction alongside historic vestiges of Islamic architecture, Mahmudova instead focuses on modest structures on the peripheries of urban centers as they compete and coalesce with the native foliage. By placing these overlooked local scenes to the forefront of her work, she examines the diversity of her homeland. Imbued with a sense of tender nostalgia, her works offer a socio-anthropological perspective of an evolving urban landscape. A central component of Mahmudova’s work is her exploration of memory, its links to identity, and how they both can be continually altered and re-remembered over time. She explains, “The scenes in my paintings have a strong personal resonance, combining places within Baku with those remembered and imagined. Each view captures a moment of stillness against a backdrop that is constantly changing.” This tension between fiction and reality in her paintings is recreated by merging abstract and figurative forms, creating images that are both inviting and disorientating. Born in Baku, Azerbaijan in 1982, Aida Mahmudova lives and works in Baku. Mahmudova has exhibited widely, and will be showing seascapes at the 56th Venice Biennale as part of the VITA VITALE group exhibition curated by Artwise. Her sculptural installations and paintings have been shown at exhibitions internationally including Here Today at the Old Sorting Office in London; Love Me, Love Me Not at the 55th Venice Biennale; Fly To Baku, London, Paris, Berlin, Moscow, Rome; and Merging Bridges at the Museum of Modern Art, Baku, Azerbaijan. Her work is held in private collections globally and her sculpture Recycled is on public display on Baku Boulevard. Mahmudova is the Founder and Creative Director of YARAT, which was founded with a group of artists in 2011. YARAT is dedicated to nurturing an understanding of contemporary art in Azerbaijan and to creating a platform for Azerbaijani art, both nationally and internationally, and has commissioned The Union of Fire and Water project at the 56th Venice Biennale.